Selling arepas from a bicycle-mounted grill in the streets of Bogotá. Something that amazes me when I walk around Bogotá is street food. Now, I don’t mean just any street food, but food that shows the ingenuity and creativity of the Colombian people. Here, foods that really should only be made in a restaurant are taken to the street, made right in front of the client, taste good, and as a bonus, are really cheap. But how many people truly eat this fast food? Street food is often considered unsafe, unhealthy or of bad quality. But whatever our gastronomical choices, we have to agree that street food is a part of people’s lives. The Food and Agriculture Organization asserts that over 2.5 billion people around the world eat street food every day, primarily because it’s easily accessible and affordable. 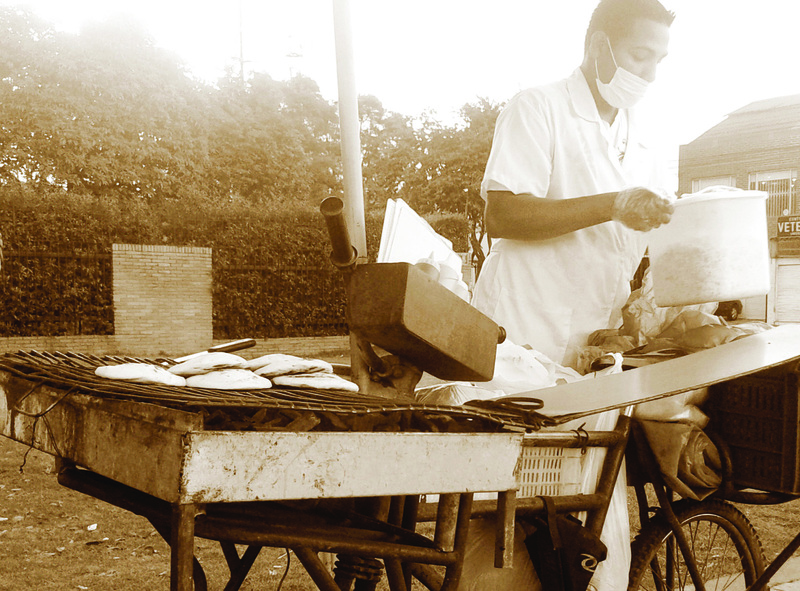 The street food industry also provides employment for millions of people with limited education or skills. 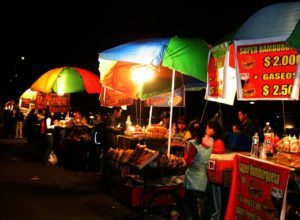 Particularly on weekend nights in party areas, street vendors line the streets offering a variety of grilled and fried snacks. On May 10, 2012 McCann Latin America conducted “The Truth about Street” study, in which over two thousand employees in 25 Latin American cities (including Bogotá) interviewed 12,000 consumers to find out their eating preferences. Up to 46% of those interviewed eat street food at least once a week, spending a total of $127 billion dollars. Can street food be safe? The World Health Organization states that street food consumed piping hot poses little or no health risk, regardless of environmental sanitary conditions. Of course, food handlers should be careful to keep their work area clean, wear aprons and hair caps if they have long hair, prepare food in small quantities to reduce leftovers, and protect food from insects, dirt and direct sun. From this we see that street food is popular for many Latin Americans, and an important source of income for many families that have been surviving tough economic times for decades. So what is notable about food on the streets of Bogotá? Let’s look at some examples of how inventive Colombians make their living. Can pizza production be taken to the street? In the late afternoon throughout the city, mobile pizza carts appear, equipped with a working table to assemble the pizza, a three deck oven, and a propane tank. I talked with Carlos, who has been making pizza for 7 years. He bought his oven downtown, and prepares all the ingredients himself. Why did he choose this type of work? Because it allows him to support his 10 member family, something he would never accomplish by working full time making minimum wage. In 5 minutes the mushroom, chicken and cheese pizza was ready: at about 1 dollar a slice, it certainly is a quick and inexpensive way to enjoy some hot pizza. Every morning all over Bogotá we see grills offering eggs and corn arepas for an on-the-go breakfast. Over these clever charcoal grills eggs are cooked in little individual pans in just minutes, and the grilled arepas have a special flavor. The arepa makers I spoke with work 6 hours daily and sell anywhere from 80-100 arepas. That means a worker can earn in just one week what it would take him a month to earn at a minimum wage job. 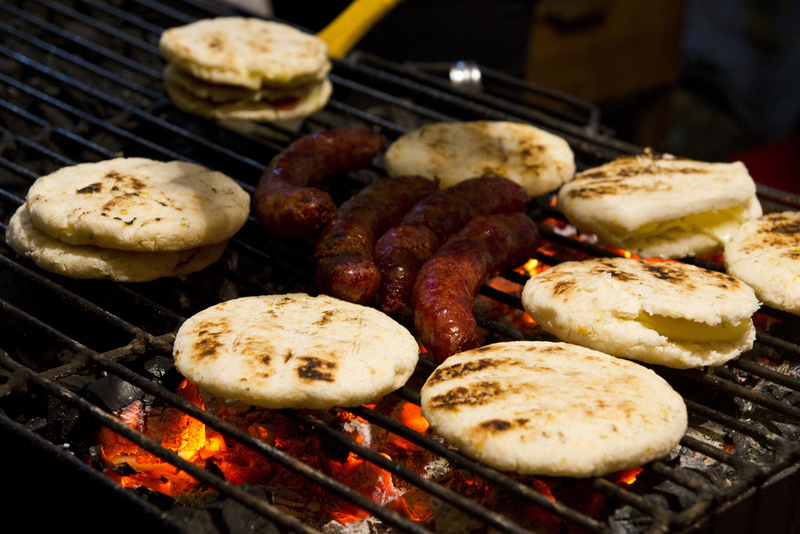 Colombian street food doesn’t get much more traditional than arepas with queso and chorizo. I watch as one of those cooks, David, serves an arepa he terms “con todos los super poderes” (with all the super powers; in other words, filled with cheese, chicken, meat, eggs and ham) in a tinfoil baggie. For about $1.70 US, it’s not a bad deal. Colombians love crêpes, and we see crêperies all over Bogotá. But how about making them on the street? Some creative cooks are making such delicate crêpes right on the busy streets of Bogotá. These little crêperie carts are equipped with the same type of griddle used in fancy crêperies. In just a few minutes, they produce what might be one of the healthiest hot street foods available, filled with cheese, mushrooms, chicken or meat cooked on the spot. Luis operates one of the most imaginative businesses I have ever seen. Buying a locally made bicycle outfitted with a rack over each wheel, he adapted a charcoal grill onto the front rack, while the other supports a large plastic basket containing all the essentials. Every afternoon Luis rides to his favorite spot near a busy intersection and sets up shop: he lights the charcoal, and from the green basket he takes out the previously prepared cheese filled arepas, sausages, shredded meat and chicken. A board set up over the seat serves as a small table to hold napkins and various sauces, and a large beach umbrella is opened over the bicycle in case of inclement weather. Luis sells about 80 arepas each weekday, working from 4 until 11pm, making several times what he would make at a minimum wage job. As the office workday ends, professionals line up to pay less than a dollar for their fast food dinner that tastes of home. All of these unusual micro-businesses show how Colombians are adept at working hard, being creative, and making the best of any situation – surely good lessons in these hard economic times.